Okay, this is my latest painting and I just can't think of what to name it! Comment below and give me your suggestions and the winner will receive a boxed set of 5 cards with this image. Thanks in advance for your submissions!!! Hope you'll like one. But even if not, perhaps they would get you a smile :). 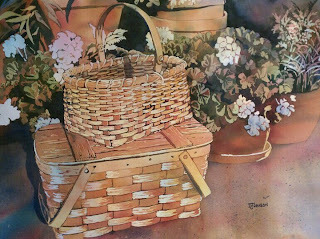 I am trying to think of something that has nothing to do with the baskets themselves...mmmmm..
Oh, darn, made a typo in my post above :(. I meant "Braids and bunches" not "Brades ...". Which is supposed to be a sound-play on the Brady Bunch - homey and happy feeling. How about "Pot Luck" for the flower pots and the basic theme of a picnic?! Or "Summer Surprise" or "Waiting for a Feast" or "Filled with Love" or "Filled with Memories" Okay, I think my creative juices are running dry now. Good luck with naming your painting, it's beautiful.